NES Super Turrican (Europe) in 08:36.39 by Alyosha. Super Turrican is an action platforming game whose distinctive feature is the morph ball mode (similar to Metroid) which lets you travel at high speed and through enemies. While this run by Alyosha only seems to be 2.41 seconds faster than the previous publication, it actually is 1 minute and 34.09 seconds faster. This is because the previous publication was erroneously played on NTSC timing, despite the NES version only being released in Europe. 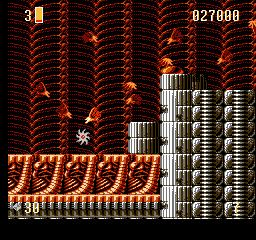 This run plays on the correct PAL timing and, as a bonus, is also on the hardest difficulty.